The 2015 AGM of the Friends of the Dorothy Neal White Collection is being held on Thursday 7 May at the National Library, Wellington. The evening will begin, as usual, with drinks & nibbles, followed by a presentation by Dr Nicola Daly on her research into “Pākehā- Māori: European-Native – ethnic labeling in the Dorothy Neal White Collection”. Nicola is the current holder of the FDNW Research Grant. She is based at Waikato University and has used her grant to make research trips to Wellington to explore her topic. The AGM will follow Nicola’s presentation. We will be farewelling three long-term committee members. The contribution of all of them has been significant and we thank them for the time and energy they have given to the Friends. We hope they will all stay on as members for many years to come. Other current committee members are standing for re-election, and we are hoping for some new committee members to take on vacant positions. The committee has approached a well-known NZ author regarding the position of Patron and we hope to have a response in time for the AGM. While working on the research desk recently I was delighted to see a researcher with his young daughter in the Katherine Mansfield Reading Room poring over a book from the Dorothy Neal White Collection. It turned out to be Monica goes to Madagascar by Max Mezger. Originally published in Germany in 1931 as Monika fährt nach Madagaskar, it tells the story of a naturalist father and his 10 year old daughter and their adventures in Madagascar. The DNW copy is a translation by Maida C. Darnton, illustrated by Hugo Wilkins, and published in New York by Coward McCann in 1936. It came to the collection from the Dunedin Public Library. Our researcher had been trying to get a copy of the book in the USA where he lives, without success, and came to Wellington especially to share it with his daughter when he discovered that a copy was held here in the National Library. When Clementine was a child, dangerous and inexplicable things started happening in New South Bend. The townsfolk blamed the fiendish people out in the Willows and burned their homes to the ground. But magic kept Clementine alive, walled up in the cellar for ten years, until a boy named Fisher sets her free. Back in the world, Clementine sets out to discover what happened all those years ago. But the truth gets muddled in her dangerous attraction to Fisher, the politics of New South Bend, and the Hollow, a fickle and terrifying place that seems increasingly temperamental ever since Clementine re-emerged. 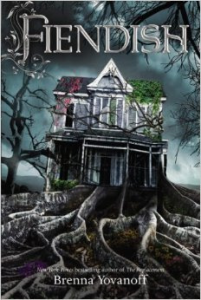 Fiendish is the latest book written by American writer, Brenna Yovanoff. Her debut novel was The Replacement in 2010. Yovanoff writes supernatural and science fiction books for young adult readers with an elegant approach to gothic style themes. Several times during the reading of it I caught myself thinking ‘That reminds me of another story’ but couldn’t quite pinpoint which stories she may have drawn on. It has a feeling of being influenced by gothic literature set in rural American towns – a place where less civilised, less educated townspeople make judgements on those who seem a little ‘different’. Perhaps a little Neil Gaiman-ish, a little H.P. Lovecraft-ish –with a wee twist of teen romance, though not so much as to obscure the main plot. I found this very readable and the characters intriguing enough to sympathise with. It was certainly hard to put it down. The book is published by Razorbill, a division of Penguin Books which targets the teenage market, with an especial focus on supernatural and science fiction topics. They have undoubtedly found a niche market with the latest interest in vampire and futurist cultures. In Newsletter 50 (November 2014) we began a series of articles by Barbara Robertson in which she shared her experiences travelling and discovering places where children’s literature is celebrated in institutions and in public art. We started by visiting Robert McCloskey’s ducklings and Louisa May Alcott’s house in Boston, and followed that with a trip to New York Public Library’s exhibition The abc of it – why children’s books matter. 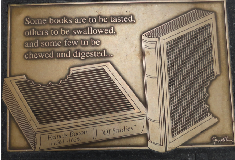 In the next part of this tour we return to New York to see the literary plaques in Library Way. 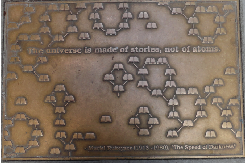 On the sidewalk in two of the streets leading from Grand Central Station to the New York Public Library there are metal plaques set into the pavement containing quotes from famous, and some not-so-famous writers. 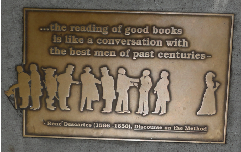 In 1996 a distinguished panel of literary experts and librarians was convened to select quotations regarding the importance and impact of literature from some of literature’s most prominent works. The selected quotes were then cast in beautiful bronze plaques by urban sculptural artist Gregg LeFevre. René Descartes (1596-1650), Discourse on the Method. “Some books are to be tasted, others to be swallowed, and some few to be chewed and digested. Henry David Thoreau (1817-1821). Walden. My daily routine has now returned to business as usual following the conclusion of A child’s war which was on show in the Turnbull Gallery from 24 November 2014 to 27 February 2015. The exhibition had very good visitor numbers (1,999), and there were lots of positive comments in the visitor’s book. It was pleasing to see a wide range of age groups, including schoolchildren, coming in to visit. The large book cover images on the wall were a particularly popular feature; these are to be made available online and will be able to be viewed via links from the catalogue records. Philippa Werry, ANZAC Day: the New Zealand story: what it is and why it matters. Philippa Werry, Dawn parade. Illustrated by Jennifer Cooper. This display ran from 5 December 2014 until 12 March 2015. The books were examples of the high quality ‘gift books’ that were produced between 1900 and 1918 for the enjoyment of children and their families. The illustrations were produced using the four colour printing process, which was perfected at the beginning of the 20th century. This method was well suited to reproducing the subtle colours of water-colour art, as seen for example in works by Arthur Rackham and Edmund Dulac. However, the illustrations had to be printed on expensive glossy art paper, rather than the thicker paper that was used for the accompanying text. Often a protective layer of tissue was inserted between the printed page and the illustration. Publishers generally chose a classic text, and always employed well-known artists. The market for these lavish books was the middle and upper classes who had the money and leisure to enjoy them. By the end of World War I, social and economic changes in society meant that these books had had their day. J.M. Barrie, Peter Pan in Kensington Gardens: from The little white bird. Illustrated by Arthur Rackham. Stories from the Arabian nights. 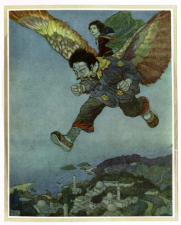 Retold by Laurence Housman ; illustrated by Edmund Dulac. This year marks the 150th anniversary of Lewis Carroll’s classic story, Alice’s adventures in Wonderland. This display commenced on 13 March and will run until approximately the end of May. 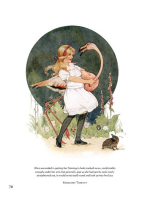 The now iconic illustrations by Sir John Tenniel appeared in the original 1865 book and many subsequent editions, and it was not until Macmillan’s copyright ran out in 1907 that other visual interpretations of the story began to appear. Over the years the enduring appeal of Alice’s adventures has inspired hundreds of artists to create their own versions of Wonderland. It was a difficult task to choose which artists’ work to put in the cabinet, but I decided to include as wide a date range as possible using books from both the Dorothy Neal White Collection and the National Children’s Collection. Storylines have announced the winner of the 2015 Joy Cowley Award. Joy H Davidson, a Napier-based writer, has won the award for her debut picture book Witch’s Cat Wanted, Apply Within. The aim of the award is to foster the publication of excellent picture books by writers permanently resident in New Zealand. The manuscript submitted must not have been published or be in the process of publication. Marjorie Pattie was a very loyal member of the Friends. While not usually able to attend meetings she maintained a keen interest and offered an open invitation to all other Friends to visit her at the Renwick Museum & Watson Library. The library has a significant collection of books and Marjorie took an active role in cataloguing these and making them available to researchers. There are three divisions of the book collection – rare books of skills from early days such as candle-making and harness-making; educational books, textbooks and copies of the School Journal from 1907; and samples of fiction read by children in the past. Marjorie was born in 1928 the daughter Archie Dixon and Dulcie Denton. She was an infant teacher and this encouraged her keen interest in educational books and literature for children. In March 1957 she married Lawrence Pattie, a farmer. 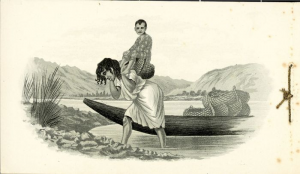 The couple lived on the family farm “Haumoana” (later known as “Hauwai”) near Renwick in Blenheim, and had two children, Rachel and Bruce. As well as her commitment to the Museum and Library, Marjorie also had a strong interest in the history of the local area, and in her family’s history. She wrote or edited several books including A century of education in the Awatere, 1883-1983 (1983), Old Renwicktown: the Olga Watson Memorial Library and the Renwick Museum (1991), and Bohally: the Fulton and Pattie families (2004). She also contributed articles to magazines such as NZ Memories. Marjorie had been in ill-health for several years before her death in January 2015. We extend the condolences of the Friends to Marjorie’s family and friends. Brian Sutton-Smith, who has died aged 90, was a developmental psychologist who turned child’s play into a matter for serious scholarship. Throughout an academic career at universities in Ohio, New York and Pennsylvania, Professor Sutton-Smith’s primary fascination was with what he called “unorganised games” – physical play unsupervised by an adult. He began his observational work in New Zealand in 1949, travelling to 35 different schools and compiling information from more than a thousand child and adult informants. What he found was “something like a frontier society, controlled from a distance by a lurking Sheriff/Teacher or two”. The children largely settled disputes on their own and playground activities were passed down across the generations. Sutton-Smith also compiled a record of all the games he encountered, published as two volumes: The Games of New Zealand Children (1959) and A History of Children’s Play: The New Zealand Playground (1981). 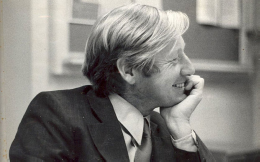 In the six decades that followed his initial research, Sutton-Smith would expand his remit in an attempt to find a “universal theory of play”, encompassing neurobiology, evolution science, history, folklore and philosophy. He was a founder member of the Children’s Folklore Society and made television appearances in America, Britain and Canada. He was born Brian Sutton Smith (without the hyphen) in Wellington, New Zealand, on July 15 1924, the second son of Ernest and Nita Katherine Smith. He later changed his name to Sutton-Smith in order to distinguish himself from other Brian Smiths in the locality. His father was a postmaster and the boys spent their free time roaming the suburb of Island Bay. They would mine the hills for cow dung, swing from ropes over the gorse and engage in the “sort of feverish exploits modern play theorists came to call rough and tumble play”. Later these experiences would move Sutton-Smith to write a serialised story about childhood, Our Street, which attracted some opprobrium from more conservative teachers for its use of slang and glamorisation of anti-social gang behaviour. Undaunted, the author followed it up with a novel for young readers, Smitty Does a Bunk (1961). In 1942 Sutton-Smith attended Wellington Teachers’ College and earned a degree from the Victoria University of Wellington, followed by a master’s in educational psychology. He went on to teach at a suburban primary school before travelling to America as a Fulbright scholar in 1952. He received his PhD in educational psychology two years later. Settling permanently in the United States, he taught psychology at Bowling Green State University in Ohio. In 1967 he moved to Teachers College, Columbia University in New York, before joining the University of Pennsylvania, where he lectured in psychology, education and folklore. In total he wrote some 350 books and articles, including The Ambiguity of Play (1997). His wife Shirley predeceased him in 2002. His son Mark died in 2013 and he is survived by his long-term partner, Deborah Thurber, and by four daughters.